Red Dead Redemption: good or bad? Neither, it’s awesome! To illustrate how much I like this game let me give you the list of Xbox 360 games I’ve completed: Crackdown, Fable 2, Mass Effect, Mass Effect 2, and Red Dead Redemption. That is a very small subset of the 360 games I own, so any game that I actually finish before I lose interest and move on is something special. I finished on Sunday evening, the in-game stats read that I’ve complete 96% of the game and spent 5+ days playing. The percentage seems about right given the number of unlocks and side-quests I’ve done, but the time played can’t be right. Raptr has me clocked in at 44 hours, which seems more accurate to me. Just as a comparison to Rockstar’s last game, I played GTA 4 for about 3 hours. First let me cover the controls. Riding a horse felt pretty good to me and I enjoyed the way galloping worked after a short learning curve, it became something of a rhythm game for me. The shooting controls are pretty easy using the normal/default settings, and the included dead eye mode (think bullet time or slo-motion) made it much easier for someone without much skill at shooters to get through some of the more difficult sections. Two other big features were the mid-mission checkpoints and the ability to skip a checkpoint. I died and/or failed quite a bit in a few missions and there was usually always a checkpoint not too far back so that I never got overly frustrated. The skip checkpoint feature I don’t actually know much about, I saw the button come up a couple of times when I was having to retry often but I never used it some I’m not sure how far ahead it let you skip or how often you could use it. This is a gorgeous game. The character and horse animations are all dead on. The world is breath taking, feels wide open, and really made me feel a part of the wild west setting. Coming out of a saloon into the bright sun, riding over a hill to be treated to the vista of an orange and red sunrise, and the glory of a thunderstorm out on the high plains. The sound in the game is just as good as the visuals too, especially the rain and thunder for the thunderstorms. This is one of the first Xbox games I’ve played where I found myself wishing I could make screen and video captures while I was playing. Of course there are some problems with the game, mostly glitches which you can check out by searching for: donkey woman, cougar man, and bird people. Personally, the only glitches I had were a couple of places where there was some clipping issues and nothing that interfered with game-play or advancing the story. Despite how beautiful the game was, the story was the part that really got me through the game. You play as a reformed outlaw named John Marston whose wife and son were being held hostage by an unspecified government agency in order to force me to hunt down members of my former gang. After the opening movie, you’re dumped in the town of Armadillo and sent out to find the first of your old friends. I’m going to stop there with the overview, everything I’ve said so far is in the first few minutes of the game but the plot gets good quickly and I don’t want to ruin anyone’s enjoyment. 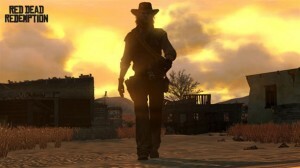 Instead, I’ll just say that unlike the GTA series, Marston is a more likeable character. Of course you have choices to make in the game and you can go more to the desperado side than the hero side if you want, but it’s nice to have more of a choice about how you want your character to act. That said, there are some instances where you’re forced to do some unsavory things, but it always made sense to me when contrasted against the story of a reformed man trying to do whatever he could to get his family back. RDR has a lot in common with the Mass Effect and Fable series. They’re semi-sandbox games but you have to progress the main story missions in order to open up more parts of the map. For side missions you have random missions, stranger missions, bounties, hideouts, and social club challenges. Random missions occur sporadically, normally someone will come running up to you and ask you to stop a thief who’s stolen their horse or robbed their store. Occasionally you’ll happen across others like an ambush, a man being chased by wolves or coyotes, a hanging, etc. Stranger missions are fixed side missions, and I can’t say whether or not these are really optional since I did them all, the tend to appear as you complete the main story missions. Overall there is a lot of stuff you can do in the game and that’s not even touching on the multi-player aspect (which I haven’t played much of so I can’t talk much about). Without risking any spoilers, I did want to mention that the pacing towards the very end of the game is a bit odd. Let me just say that the game is not over until you see the credits roll. Oh! So jealous! I need to get this game so bad. Glad to read such a great review. I actually enjoyed GTAIV a lot, but it sounds like RDR will be even better for me. I really like westerns and it has been way too long since in played Gun. 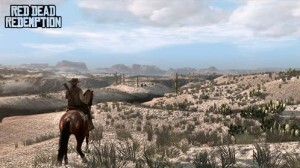 Sounds like you’d love this game then if you enjoyed GTA and like westerns. Cool! I’m definitely going to give this game a try now, since I loved Fable 2 and the Mass Effect games when it comes to story and enjoyed the sand boxy feel of GTA. The mid mission check point option is what really sold me, and the fact I don’t have to be a very good shooter to get through this game (because another thing that annoyed me about GTA was the awkward shooting). I’m not even going to wait for my brother to get this game, maybe I’ll just trade in Alan Wake (great game, but has little replay value) to see if I can get credit towards it. 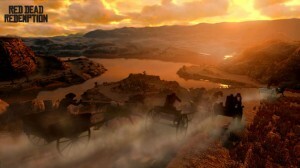 The other improvement is riding a horse in RDR versus driving a car in GTA. Anytime I got behind the wheel in a GTA game, I drove like I’d had four shots of whiskey. Riding a horse in RDR was a much better experience. I hope they do release this for PC, generally Rockstar always does but I haven’t heard anything about it yet. Nice job, the only sandbox game that I have ever completed was Saints Row 2, but I think Red Dead will be the second. I like it enough that if it came out on the PC I would buy it, plus I need more points for my gamer score! I am pretty much spazzing to play this. As soon as I grow more spare time I’m getting i for my 360. *sigh* I need more hours in the day. I’m WAY behind.